So Mncuchin interrupted his Cabo San Lucas vacation to calm markets. After all, nothing exudes confidence more than making a few phone calls from your Mexican resort to the top six bank CEOs to confirm they don’t have a problem with liquidity. Especially when absolutely no one was ever claiming liquidity was an issue. 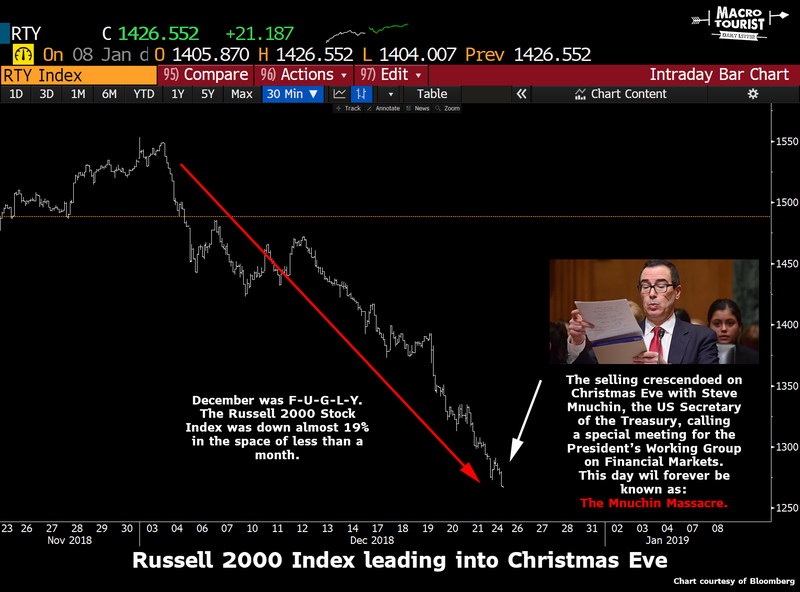 Now many blame Mnuchin’s brain-dead move for the massive sell-off on Christmas Eve. 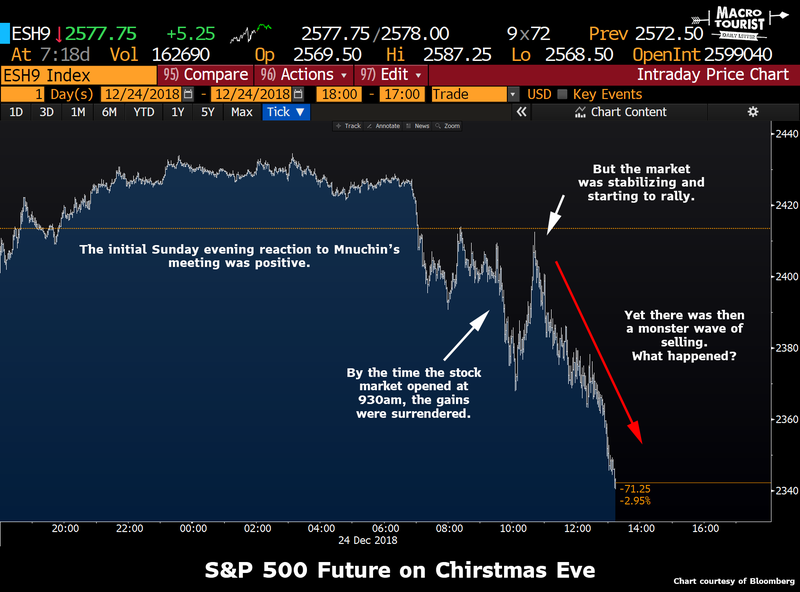 After all, the day before Christmas is usually a slow trading day with markets closing at 1pm as traders rush off to do their last-minute shopping. Yet instead of a slow listless trading day, it was an absolute bloodbath reminiscent of a Game of Thrones episode. The S&P 500 future closed down 71 handles - almost 3%! Was it Mnuchin’s fault? Who knows? I don’t think he helped. But what many overlook is that stock market futures were initially up on his stunt. Sunday night after his announcement, spooz were trading up more than 20 points. Granted, by the time the cash market opened at 930am the stock market had given up those gains, but if we look at the intraday chart, after an initial dip right after the open, the market looked like it might bottom. By 1030am we were approaching unchanged on the day, and then it happened. There was a monster wave of selling that took the S&P 500 down a sickening 3% in the last three hours of trading. It was illiquid and made little sense for traders to demand liquidity on the day before Christmas, yet they were spooked and took a “shoot first ask questions later” attitude. And what drove this panic? I don’t want to bother discussing whether Trump is correct in his assessment of the Federal Reserve’s policies. Who cares? It is what it is. I don’t want to end up one of those old men yelling at clouds. 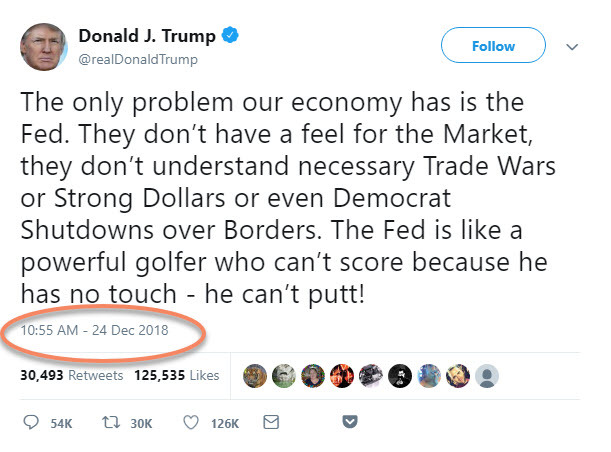 I am only interested in what it means for the market, and it is my firm opinion that Trump’s ongoing feud with the Federal Reserve contributed to a collapse in confidence that caused the financial market sell-off of December. I was out for dinner with a good buddy last night and he remarked that I had become one of those Fed watchers that I used to make fun of. You know the type - desperately trying to explain every tick through slight nuanced changes in Fed officials’ language. Yet my response was that the Fed was all that mattered lately. I would be foolish to ignore the 10%+ swings due to the comments from both the Federal Reserve and the President. And I contend that predicting Powell’s moves in the upcoming quarters will mean more than trying to come up with a fundamental fair value for financial assets.